Aerica’s Boutique has out this gorgeous lingerie set as their hunt gift! This set includes Lolas tangos appliers and is absolutely irresistible! This would make a fantabulous present for that special lady in your life! Behind me to the left we have a lovely entry way table by Storaxtree (NOT a hunt gift! ), it actually has a cactus on it, but you can’t see it in the photo… on the table, we have the gorgeous music box from Chapel of dreams, as well as the photo frame and bouquet of roses from HPC! UNDER the table is a super cute kitty cat on a guitar, which is the hunt prize from Wedding-2-go! From Easterling, we have this cute little pink and black set. This set also comes with tangos appliers, and is just perfect for your sweetheart… assuming your sweetheart is a lady… or a guy who’s into that sort of thing… anyway, moving on! Behind me and to the RIGHT is the hunt prize from Aster’s builts! The lovely silver tray poufs hearts, gives out champagne and chocolate, and is the perfect addition to your Valentines setup! I dragged my honey away from whatever he was engrossed with to show off two of the his and hers type gifts. 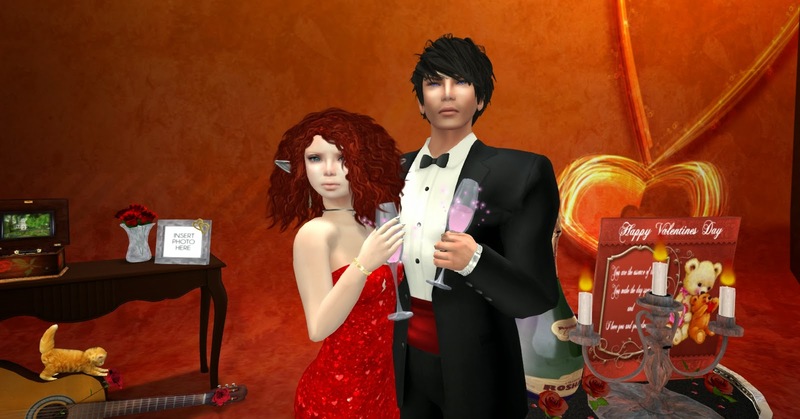 Harmony designs has out a gown and matching tux, both done in mesh, and both featuring a luscious shade of red. “The Hunt” has cute matching bracelets that read “To Infinity” and “and Beyond”! So sweet! After your sweet soiree on Valentines day, come home and snuggle your lovey in the snuggle chair from Serendipity designs! It has a ton of animations, and is perfect for cuddles, photos, or that after-party nap you may need! ← Happy birthday, Skyclad fashionista!